Fylde’s lead in the National League title race was cut to six points after this disappointing defeat at relegation-threatened Celtic. Fylde fell behind after Danny Wisdom headed home but were back on level terms when Danny Rowe tucked away the Coasters’ 100th league goal of the season. However, eight minutes after the break Danny Pilkington dealt the killer blow after rounding keeper Rhys Taylor. Second-placed Kidderminster Harriers travel to Stalybridge themselves tomorrow, when victory in their game in hand would reduce Fylde’s advantage to three points with four to play. Manager Dave Challinor made one change to the side that demolished Darlington 4-1 the previous weekend, with David Morgan replacing the injured James Hardy in midfield. Rowe had the ball in the et inside eight minutes, when he latched on to a ball over the top and lobbed keeper Grant Shenton but the linesman’s flag was raised. Midfielder Dan Bradley nodded narrowly wide from Sam Finley’s corner as the Coasters pressed for an opener on a difficult pitch. 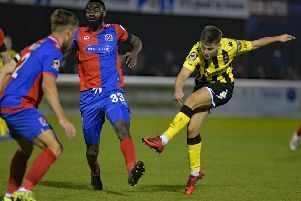 The midfielder should have opened the scoring around the 15-minute mark, when he was played clean through by Rowe but almost had too much time as his eventual strike hit Shenton’s legs. The away side were causing all sorts of problems and Shenton had to be on his toes again to hold Bohan Dixon’s header at the back post. The chances kept on coming and Finley spurned a gilt-edged opportunity. Andy Bond raced clean through, and although he delayed his shot too long he did find Finley on the six-yard line but his scuffed effort was saved. Missed opportunities were to prove costly when the hosts took a shock lead on 23 minutes. A corner from the left was prodded goalwards at the back post and Danny Wisdom headed the loose ball into the bottom corner. That milestone goal for Rowe ensured the lead lasted only four minutes. The frontman controlled in the area and put captain Matty Hughes on his backside before rolling the ball inside the near post for his 43rd of the season in the league. Stalybridge carved out a rare opportunity when a cross into the box landed at the feet of the unmarked Wisdom and Taylor had to react quickly to prevent the left-back from doubling his tally. The stopper was forced into another decent save at the far post after Wisdom’s low cross found Pilkington lurking. A poor goal-kick presented Dixon with a chance to shoot, but after beating his man on the edge of the area the midfielder dragged his left footed strike across goal. The hosts started the second half brightly and should have restored their lead when Bishop couldn’t convert Roberts’ low cross at the back post with the goal gaping. However, Celtic didn’t have to wait long for a second goal as Pilkington beat the offside trap before sliding the ball into the open net. Momentum was building for the hosts and Adam Mather should have scored at the far post after Taylor palmed away a strike by Pilkington, who was proving a real menace and was a whisker away with a diving header. The Coasters were struggling to get a foothold and Bradley’s strike from distance, which whistled over the bar, was their only chance of note. Fylde were restricted to long-range efforts and Shenton made light work of Row’s stinging effort from 25 yards. Bradley had a late chance to salvage something, when he latched on to a flick from substitute Matt Blinkhorn, but his strike from 20 yards was straight at Shenton. Subsititute Porya Ahmadi almost added a third for Celtics in the dying seconds but his looping effort from the edge of the area drifted narrowly wide. Manager Challinor bemoaned a game of two halves as Fylde suffered a second successive away defeat. The Coasters boss said: “I’m disappointed with the difference in performance more than anything else between the first half and second half. It was like chalk and cheese. “We knew the pitch was horrific and it was worse than I thought it would be when we got here. “But we’ve been working all week towards this and we knew they would be pretty direct. “In the first half we were brilliant. You could argue the game should have been over with the chances we had. “It wasn’t and then we switched off from a corner. We got ourselves back in it after we had three one-on-ones. “At half-time you’re looking to push on but our performance was shambolic. It lacked everything really. “Whether it was too easy in the first half... you try to say the right things at half-time about how to go about the second half and to keep on doing what you were doing in the first half. “Whether that falls on deaf ears and they think they are better than they are I don’t know. AFC Fylde: Taylor, C. Hughes (Daniels 45), Collins, Langley, Kennedy, Bond, Finley, Morgan (Blinkhorn 75), Bradley, Dixon (M. Hughes 66), Rowe. Subs not used: K. Kennedy, Baker. Stalybridge: Shenton, Morton, Wisdom, Hughes, Mather (Wilkins 72), Chalmers, Dunbar, Regan, Bishop (Ahmadi 86), Roberts, Pilkington (Bakare 89). Subs not used: McKnight, Deacon.